Andrea is the fourth of seven siblings. Her parents, Juan and Maddy, and the three youngest kids live in the small Bolivian town of San José de Chiquitos, where her father farms. 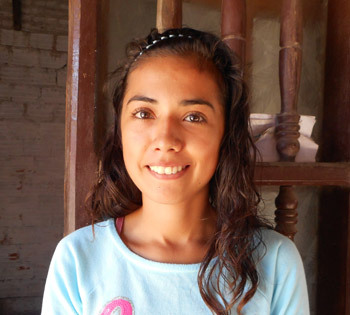 Andrea and one sister live with their aunt in the city of Santa Cruz so that the two girls can attend high school. When she was just three years old, Maddy noticed that Andrea’s heart would often start racing, leaving her little girl out of breath. The local doctors in their hometown said it was normal and sent them home. Once she was in school, Andrea found that she couldn’t keep up with her classmates during recess or gym class. The problem persisted into her adolescence, and Andrea was increasingly frustrated by her shortness of breath. With her now living in Santa Cruz, the family was able to take Andrea to a larger hospital where she was finally diagnosed with congenital patent ductus arteriosus. Given the family’s limited resources, they were referred to Puente de Solidaridad for assistance. After her surgery, Andrea is very excited to breathe normally for the first time in her life: I want to move forward and be healthy. Many thanks for your help!